Recently AccelTex unveiled their latest product, their Accelerator battery. 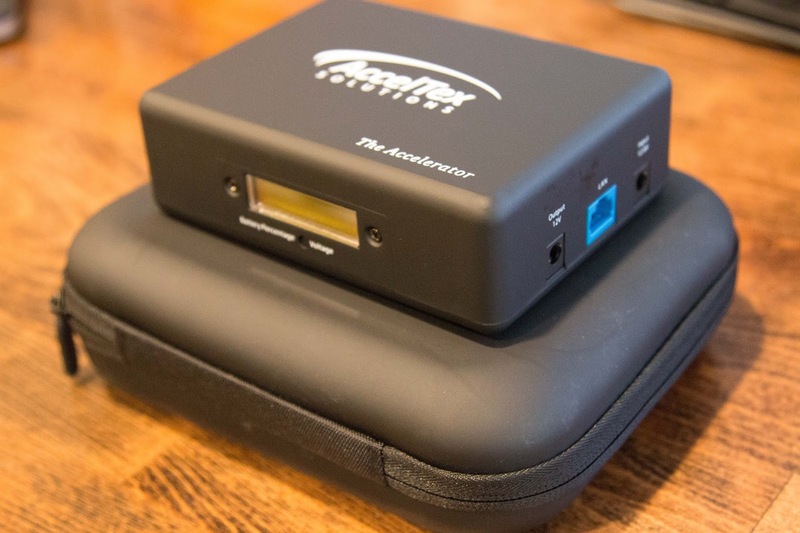 Although battery packs are not novel to the world, there are only a few that are designed for Wireless Site Surveys, which is exactly what the Accelerator was designed for. 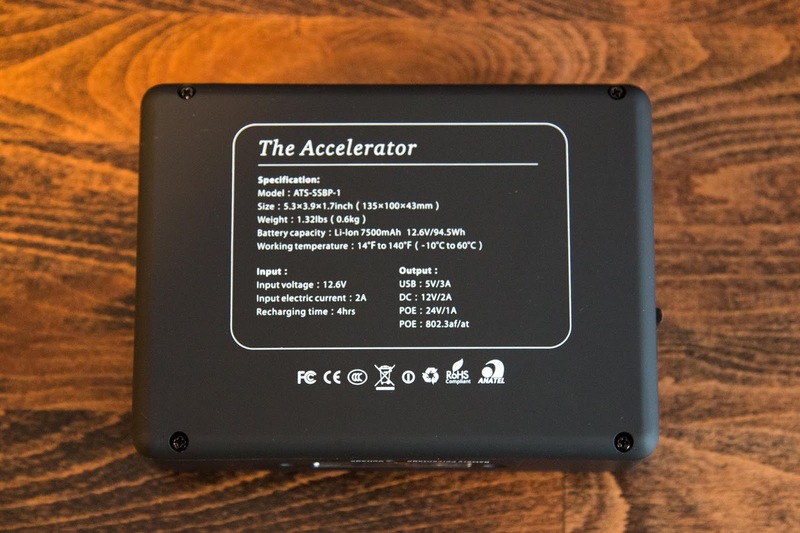 Listed at a scant 1.32 pounds, the Accelerators form factor is perfect for travel. 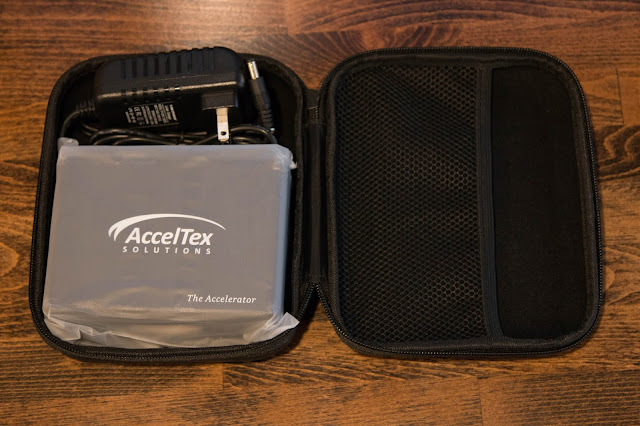 Rather than slogging around with a battery the weight of a cinderblock, Acceltex has been able to pack the perfect amount of run time into a nice little form factor. I’ve been comparing its size to people as about half of a paperback novel. If you want to get technical about it, its 5.3” long, 3.9” wide, and 1.7” tall. As for runtime the 7500mAh should provide you with enough power for almost a full day of surveying. Many of the reports I’ve seen on Twitter have shown it to provide about 6 hours of power for a modern AP. It also charges quickly, I found it jumped about 40% during a quick one hour “lunch charge.” Going from 35% up to 74%. A full recharge will only take 4 hours as well. Which, all things considered is pretty quick. The layout of the battery is close to perfect, with only a few minor quibbles. First, on the right hand side you’ll find two barrel plugs. One is the charging port while the other is a 12V out. When I asked about the 12V out, AccelTex told me they have used this to power Cradlepoint routers. Although I’m sure there are a number of other uses as well. Also on the right hand side, you’ll find the LAN input. On the opposite side of the battery you’ll find two RJ45 ports on either side of a toggle switch. 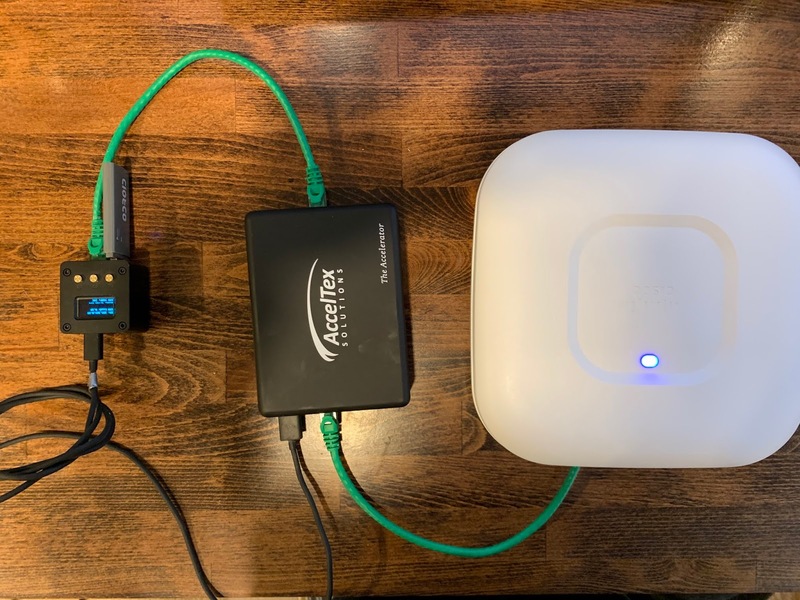 One is a typical 802.3af/at PoE output, and the second is a 24V PoE output. The 24V was the first thing that jumped out at me when I started looking at the unit. There are a few Access Point manufacturers that utilize 24V PoE such as Ubiquiti, as well as some security camera manufacturers as well. This, coupled with the 12V barrel output make it a very flexible platform. 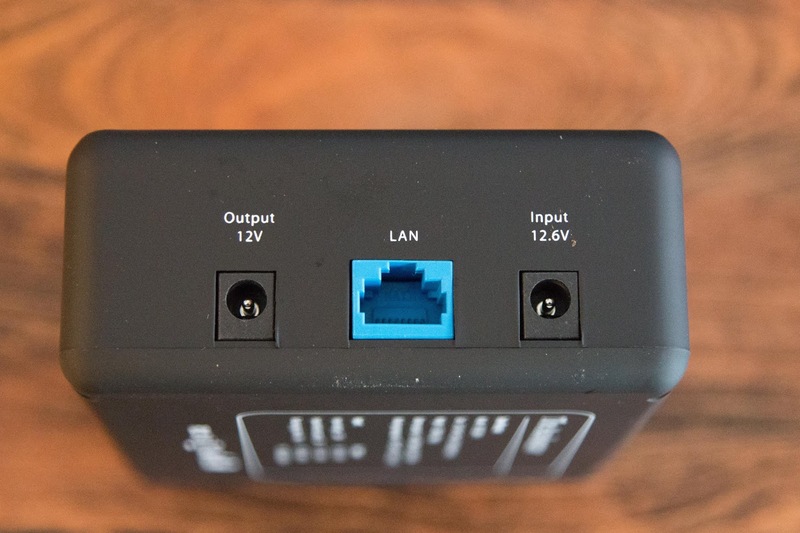 Nestled between the two RJ45 ports is a simple toggle switch. When in the middle the unit is off. Then, if you push it towards one side or the other it will turn on the power for the indicated port (either 802.3af/at or 24V PoE.) 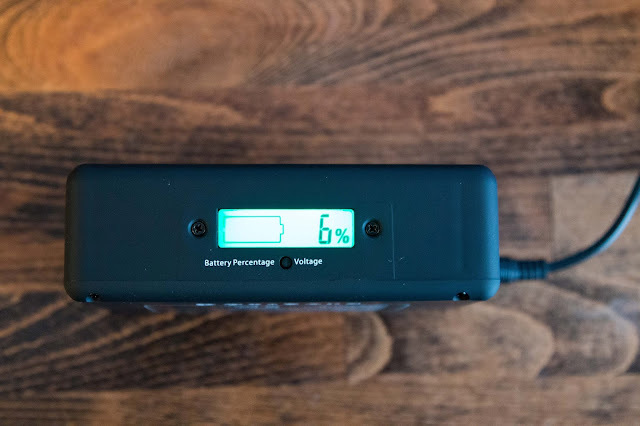 On this same side of the battery you will also find a 5V USB A Output. As you will see in the photos, I was able to power my WLAN pi through this as well as a Cisco 2702I with no issues. On the front of the unit is the display. It’s a very simple LCD display with a battery indicator, and battery percentage. Under the display is a small button that you can push to toggle the battery percentage to Voltage. That is, if you can actually push the button. With all that out of the way, lets delve a bit more into my thoughts and opinions on the unit. First, a couple of caveats that should be taken into account. AccelTex was kind enough to supply me with a unit for testing. They provided absolutely no requirements for me to review, blog, or even talk about the battery. Further, I was sent one of the first production units. As such, there were a few concerns I had that AccelTex has already addressed, but I will still point them out here. 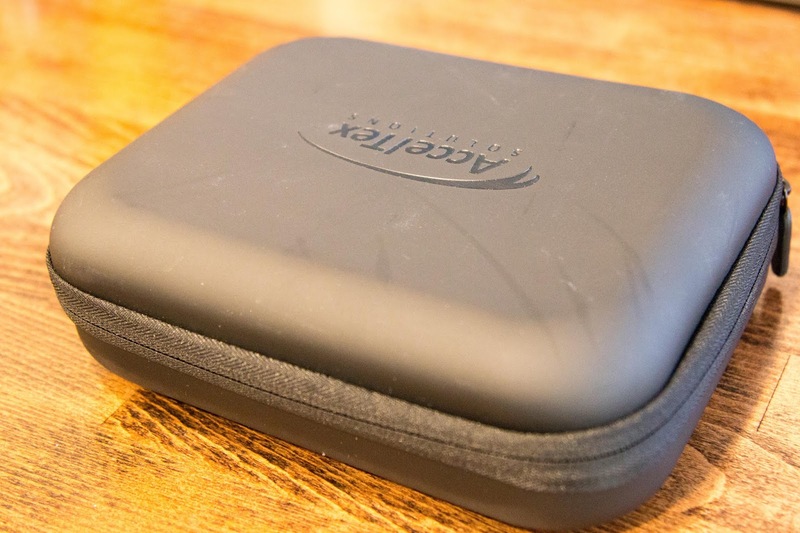 AccelTex includes a nice case (as cases go) with the battery. It has just enough room for the battery itself, its charging cord and an additional 12V jumper cable. This will help keep everything together when travelling. I’ve also already found that it helps me remember to bring along the charging cable, which by itself is invaluable. One of the first things you’ll notice about the unit (and its case) is the texture and color. Both are fairly sleek, with a matte black look. However this texture does seem to pick up dust and fingerprints very easily. When I brought this up with AccelTex they actually mentioned that more often than not, the battery won’t be “naked” like I’ve had it. But they now have a form fitting case for the battery that contains connectors and straps so that you can attach the battery directly to your survey tripod. I have not received a case yet, but the photos that I’ve seen look great and make it that much more versatile. The first thing I did when taking it out of the box was go to charge it. Well, at least I tried to anyway. The charging cable is only 36” long. I understand that this may seem like I’m looking for things to be critical about, but I found this irksome. Due to the great form factor of the unit, I can see a lot of people leaving these attached to their survey rigs. So having a longer charging cable that allows you to do so would be fairly important. The second thing I did was look at the display. There is nothing like the nice warm glow of a lit up green LCD. My only concerns with the display were that it never shuts off, even when the unit is off, which could lead you to accidently leaving the battery on. As the only indicator that the battery is on (other than the switch) is the small indicator on the RJ45 port that’s being powered. I also found the button to change from Battery Percentage to Voltage to be a bit small and hard to push. Although it’s certainly doable, and quite frankly, how often are you going to need to toggle between the two? In my notes I actually wrote in two different places how I keep expecting it to weigh more. I don’t know if it’s that the form factor is a bit “brick-like,” and that’s what makes me think it’s going to be heavier. But it really is remarkably light for its size. The last of my nitpicking is with the name itself. I mean, I get it, it’s a play-off of AccelTex. But… meh. Maybe it’s the fact that there’s the word "The" in front of it. “The Accelerator” The same thing annoys me when people say they went to “The Ohio State University.” Also the name itself (the full name, including “the”) is written on the top of the battery in what appears to just be just italicized Times New Roman. I suggested that they rename it the DCR-1, which I think in almost any font would look good. But for whatever reason they have yet to take me up on that suggestion. I think AccelTex really hit it out of the park with this one. I have a few minor gripes with it, but all in all it’s a great battery. Especially when you consider that MSRP is only $299.95. 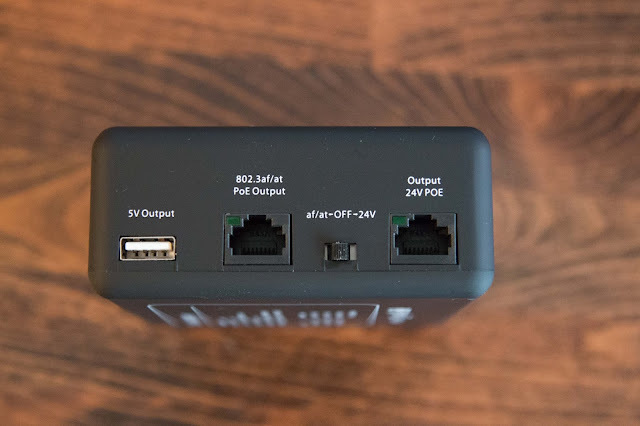 With the addition of the 12V barrel output and 24V PoE, it’s a very versatile solution. It has a great run time considering its weight and form factor. As well as a quick recharge time. It’s certainly going to be the platform that I suggest moving forward.